The Puerto Rico Science, Technology, and Research Trust (PRSTRT) was created in 2004 to promote innovation, technology transfer, and commercialization of intellectual capital. The mission of the Trust is to invest, facilitate, and build capacity to continually advance Puerto Rico’s economy and its citizens’ well-being through innovation-driven enterprises, science and technology, and its industrial base. A parcel of land of 70 acres was entrusted to the Trust to be developed as Science City. The vision for Science City is to become a globally recognized innovation hub connecting and integrating our science and technology ecosystems. As a multidisciplinary international center of collaboration it will inspire new ideas, inventions, and enterprises, resulting from its vibrant and rich environment to innovate, work, and live. Science City, inspired in other research parks like the Research Triangle Park in North Carolina, will work with researchers to promote commercialization of their projects with the idea to create more patents and new businesses in Puerto Rico. The PRSTRT is taking several actions to transform this vision into a reality. For example, the Technology Transfer Office (TTO) is open under the direction of Dr. David Gulley and it’s providing the tools and processes needed for product commercialization. The TTO serves private universities and soon will serve the general public in matters of intellectual capital management, product service licensing, and IP monitoring. If you arrive to our Headquarters, you will see a lot of activities going on. For starters, the Puerto Rico Environmental Research Laboratory construction is at full speed. This state of the art laboratory facility will house the Puerto Rico Environmental Quality Board (EQB) laboratory. In partnership with EQB the Puerto Rico Science, Technology, and Research Trust will provide to our environmental researchers and scientists the use of this 16,000 sq. ft. facility to perform activities such as environmental parameters analysis, new materials, and/or products qualification and/or validation. This eco-friendly remodeled building will also use energy efficient technology. The project schedule is on time and we expect to complete the project by September 2016. Meanwhile, members of the EQB and researchers started conversations about future collaborations through our Research and Innovation Meet-ups. In addition, the Puerto Rico Science, Technology, and Research Trust signed a contract with AFI to manage the construction of Laboratory Road, one of the two projects we are undertaking to develop Science City road infrastructure. “Vía Laboratorio” will connect De Diego Avenue with the Science City Boulevard. 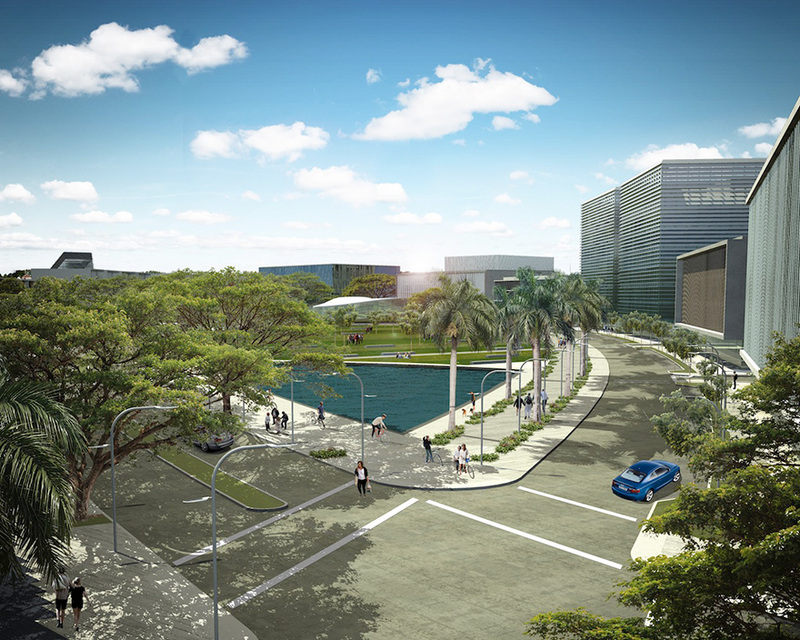 The boulevard will be responsible to connect Science City with the Medical Center and the University of Puerto Rico Comprehensive Cancer Center. The “Vía Laboratorio” is on target from the schedule and cost point of view and we expect substantial completion by October 2016. Our current Dry Lab facility housed about 10 startup companies in addition to PRSTRT headquarters and personnel. We also home two companies that are working with the recently established Puerto Rico Consortium for Clinical Investigation (PRCCI): PharmaSeek and The Clinical Research Group, Inc. (TCRG). We are aggressively pursuing additional tenants for Science City based on a Science City marketing plan prepared at the end of 2015. The marketing plan identified potential anchor tenants for the site based on Puerto Rico’s R&D capabilities and competitive factors such as availability of scientists in the sector and labor cost assessment for the R&D personnel. Main targets based on the study are: (1) Medical Device companies, (2) Companies in the Information Technology sector, identified as the most competitive sector, and (3) Biopharmaceutical and Biotechnology companies, including a small number of Contract Manufacturing Organizations (CMOs). The latest tenant from the information technology sector is Atlantic Technical Organization. Atlantic is a new data analytics and machine learning company based and staffed in PR. It is already working with the Heritage Group in California to leverage data science to improve healthcare delivery and outcomes for patients. Puerto Rico Science, Technology, and Research Trust is in the process of selecting a site master developer for Science City. We are looking for experienced master developers with financial and marketing capability to develop Science City to its full potential. We expect to complete the selection process before the end of October 2016. In Science City, our community of researchers, entrepreneurs, and investors will work together to move Puerto Rico’s economy and global positioning forward. That is why I invite all of you to join theForward Research and Innovation Summit. There you will see, for the first time, all the players together, talking, discussing ideas, innovating, moving Forward. Hope we see you there! About the author: Ms. Crespo is the CEO of the Trust. For over 30 years she held several positions in Hewlett-Packard PR, the latest as general manager of the Business Enterprise division. She developed, implemented and managed activities such as product launches, research and development, manufacturing, customer services, re-engineering processes, business planning and delivery service. She provided support to the operations of the supply chain in Europe and Mexico and managed the Latin-American operation Unix. Under her leadership, HP-PR received the Presidential Award for Quality HP. Crespo was the first woman president of the PRMA, winner of the Hector Jiménez Juarbe prize and has been recognized by various institutions, including the Chamber of Commerce, SME, AIHE, ASQ and Illustrious College. She served on advisory roles under the administrations of former PR governors. She has BS-IE from the UPR-Mayaguez and is member of their Honor Society and studied Executive Development in Kellogg’s Graduate School of Management at Northwestern University.